A big shout-out to T-Mobile product manager Des Smith who reminded me of an epic moment in T-Mobile history as today marks the fifth anniversary of the T-Mobile G1. Today actually marks five years since the device was announced and not released mind you so there’s another 5 year “anniversary” date we can celebrate in October. We had been working for months and months with a small team in Building 44 in Mountain View, CA. We had seen about 9 different versions of the new “Homescreen” for Android and I still wasn’t completely certain we had seen the last one. I remember Fridays being “Donut Day” at the cafe there, and the arcade where I would spend my lunch with a bunch of Android coders playing old school video games – the team was bursting with excitement over what they were building and bringing to the world. In a Google+ posting, Smith fondly remembers the excitement he felt the night before T-Mobile and Google announced the G1 to the world at a special event in New York City. It’s a fond memory for me as well as it remains of the best days TmoNews has ever seen in terms of traffic and engagement. There are a few other days that have surpassed that epic moment in Android history, but the G1 announcement was one of the moments I attribute to TmoNews moving into another level of tech blogging. As Smith notes, today Android is everywhere, on our smartphones, wrists, refrigerators, cameras and eyewear. Tomorrow, Android may be power a new space shuttle or be the OS that powers your in-car navigation. The future for Android is bright, of that no-one can argue and sometimes its nice to sit back and think of where it all began. Oh my first smart phone! the memories! Happy birthday G1! You were my first Android phone and I am glad that Tmobile gave Google a chance to shine. That moment has paid off as the Android OS has become one of, if not thee, most popular OS World Wide. It would be nice to see a G3 released for the 5 year Anniversary… if not at least the OS will continue to grow and live through other phones. Crazy to think that in 5 years we’ve gone from that device to the ones coming out now. Quad-cres. Gigs of RAM and storage, no more keyboards, etc. It’s kinda crazy to think about. Sad about the keyboards, though. I was at first. With SWYPE and voice-to-text I haven’t missed it much. It was quite a change leaving it behind. The phone that started a revolution. I stand in reverence. Its crazy I remember going through the training as a corporate employee and then finally getting my phone. It was awesome. I bought and tried the G1. Didn’t like it. I returned it. IMO, the hardware felt cheap and looked like a toy. The chin on the phone felt weird when holding the phone. I wasn’t a fan of the lack of video player software, and other stuff. I had a G2, I missed the boat on the G1. But this demonstrates T-Mobile’s importance to the cell phone industry and why it needs to remain distinct from the other three companies. Verizon’s Droid was just a copy of the G1 and Sprint hasn’t had an innovation since the walkie talkie feature their phones had ten years ago…which was just a copy of actual walkie talkies. AT&T has never had an innovation, choosing to ride Apple’s coattails instead. Whatever the next big thing is, you know it’s going to come from T-Mobile. The G2 was AWESOME!!! I sold it on eBay to get teh Galaxy S2, ad it was still working like a Boss when I shipped it. The G2 is my favorite phone I’ve ever had. That thing was a tank, I abused it and it just kept going. By the time it was starting to slow down it was no longer available and I moved up to a MyTouch 4G Slide very briefly before making the move to the Galaxy S3. Obviously the G2 doesn’t have the specs to keep up with the demands that technology puts on phones now, but man, if T-Mobile ever turned out a G3, I’d drop whatever phone I had at that time and buy it in a heartbeat. I loved that phone. The phone that kept me from jumping ship for the IPhone. I still have the G1 in my closet. That phone was awesome….though slow. I still have my G1. It is hibernating in my bedroom closet. Can’t believe its only been five years. From the sidekick to the G1 to the phones we have now. It is amazing how far smartphones have progressed. Happy Birthday I still got mine and it`s in mint condition. A toast to the device that got the ball rolling! The G1!! This one bring a lot of memories. I remember this website being very active around the time the G1 was released. People were going crazy on the forums and one memorable event was this guy/girl telling everyone the leaked pictures were all wrong. This person claimed to have seen the real G1 and it looked nothing like the leaked image. The phone was finally announced and it turned out to be the leaked image. Needless to say, some were happy but others were disappointed. I ended up buying the brown one for my wife and the black one for myself. I’m sure those who’ve been on this website for a long time will remember the story above. I loved my white G1 until it decided to take a dive into Lake Michigan. I loved my G1….still have it in fact. Rooted it shortly after I got it, kept it until I got my S2. Never had a G1, but I had a G2 and it was an amazing phone. I always liked the little touchpad at the bottom and found that it came in handy when I needed a “fine touch” to click on a link. Sad that the G-series died out – I’d like to see a return of it. I think that was T-Mobile’s true differentiator much like the “Droid” phones on vzw. i’m a proud owner of a g1 & g2..great phones that served their purposes..feel like that’s the point in time where android hardware makers we’re being creative, everyone was doing their own thing and hardware was as exciting as software..now all we really have to look forward to are software updates..
And it would be great if they ever do bring back the G1 & sidekick that it should be under Google so they can receive updates before any other phones like the Nexus lineups and Google variants of HTC One and the S4! Funny how T-Mobile and HTC started the Android launch but don’t lead the pack in 2013. Samsung is pushing out the most Android phones and Verizon took Android awareness to another level with the droid line. Technology has made leaps and bounds in just 5 years, just imagine in another 5 or 10… Crazy to even ponder the possibilities. Yep I left my reliable Shadow with Windows Mobile for the new buggy Android (at the time). I stood in line early with others at my local Tmobile Corp Store on launch day. Remember when there were only a few apps in the App Store? Remember maxing out the memory with apps? Remember modding it with Cyanogen’s first version ever released, then every nitely thereafter, until the G1was considered too old and limiyed to mod anymore and modders were on to the newer mobiles? I still have two G1s in near perfect condition. i got it on release day, loved it. 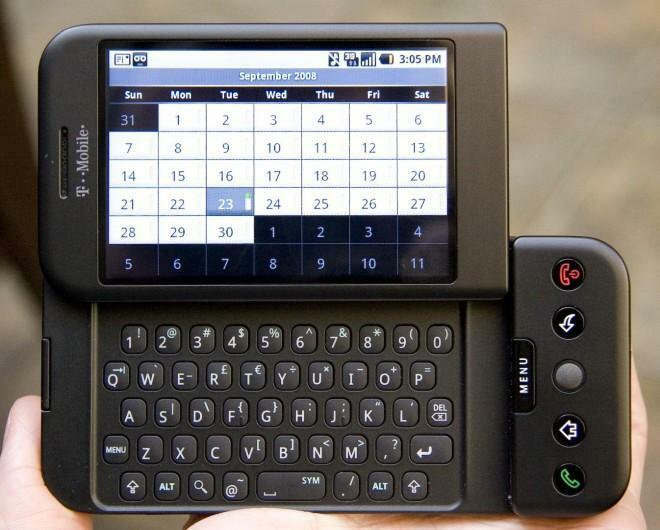 sadly htc stopped caring about us and never did a g3. waited forever. finally moved to mtg3s, mt4gs, note ii and now note iii. see ya htc. I still have mine in my room, love this phone to death. I geeked out on the open source nature, being the linux child that I am. I remember some of the 1st apps, like Breadcrumbz, Biowallet (beta), ShopSavvy, PicSay, YouTube, PacMan, Shazam, Locale, and the innovative Zombie, Run ! The granddaddy slapped the snob nosed iClone users in the face with expandable storage, removable batteries and open source platforming. We’re still doing it 5 years later. Long live andy ! I still have my g-1 I’m waiting hoping for a g-3 to come out.I actually don’t understand why T-Mobile stopped with the g-2. I got my G1 in 2010. Now I call it the dinosaur. Webpages crash the browser presumably because it has so little RAM. The best ROM for it is limited to Android 2.2 Froyo, called FroyoByLaszlo and it causes occasional freezing up, sometimes due to overheating. So sometimes when I reboot it I have to stick it in the refrigerator for a minute to cool it down as it boots up before the CPU speed down-clock kicks in. Or I take the back off and pull the battery to reset it, and I might have to hold the phone in the air conditioning vent of my car to keep it cooled down for a minute. Yeah, it’s my backup phone now!